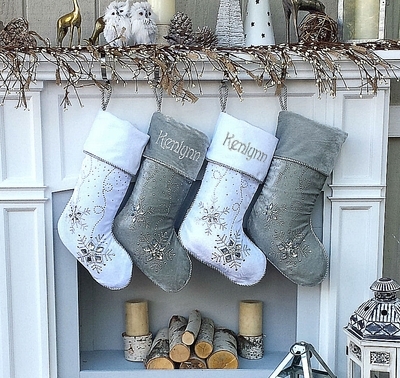 The stockings are pictured with embroidery in ANTIQUE SILVER METALLIC THREAD that matches the best to the color of both stockings and the metallic twist rope. Materials are gorgeous white and silver grey velvets, cuff and stocking is adorned with metallic silver twist rope and inside lining is white satin material to give the stocking substance. Decorated with metallic studs and glass gems Personalized Christmas Stocking in Velvet and Metallic rope and winter Bling Ice Crystal Gems. Classic Luxury. Fully lined inside. Stocking measures 20" diagonally from stocking loop hanger to the toe. The top opening is about 7.5 inches wide. On this stocking, we do not offer SCRIPT FONT as it does not look good. The cuff tends to "pucker" when embroidering this font, so we prefer not to offer it so you would receive a beautiful embroidery on your names.